Pressure is applied to the liquid mixture as it is forced through very small filters. The filters break larger molecules into smaller pieces so all the molecules are similar in size which helps them blend together evenly. An example of two such substances is oil and water. Emulsifiers are very effective in applications in which a high shear is required because they can provide fast mechanical and hydraulic shear. Emulsification may also be achieved by adding emulsifying agents. Emulsifiers may be inline or separate freestanding machines; while some applications require specific types of emulsifiers, others can be achieved through a variety of methods. Cost effectiveness and efficiency are often the most important considerations when choosing emulsifiers. Emulsifiers are found in the food, medicine, chemical and adhesive industries among many others. They are used with countless substances including food coloring, syrups, beverages such as milk, medical ointment, lotions, creams, vitamins, shampoos, detergents, toothpaste, hair dye, petroleum products, silicone, adhesives, polyurethane and many other products or ingredients. Emulsifiers are just one kind of industrial mixer. Emulsifiers may be used as the sole method of mixing or blending in a product line or they may be the first in a series of mixers. Other common types of mixers are homogenizers, ribbon blenders, paddle blenders, vacuum blenders, high shear mixers and agitators. Ribbon blenders are horizontal blenders containing two helical blades with one inside the other. They push the contents of the mixer both inwards and outwards for thorough shearing mixing action; typically used at full capacity to mix dry or powdered ingredients, ribbon blenders blend wet ingredients as well. Paddle blenders are similar, moving dry or powdered ingredients laterally and radially with paddles coming out from a horizontal screw. Vacuum mixers and dryers can have horizontal or vertical construction and use a combination of low internal heat and vacuum pressure to blend the mixture while removing moisture. High shear mixers are mixers that utilize counter-current mixing. During counter-current mixing, the mixing pan and the mixing tools rapidly revolve in opposite directions, placing very high parallel forces upon substances which results in substance uniformity. Agitators are industrial mixers that are powered by impellers to mix substances with low viscosities in low-shear applications. Agitators range in size from small agitators used in laboratory applications to large industrial agitators with 10,000-gallon capacities. 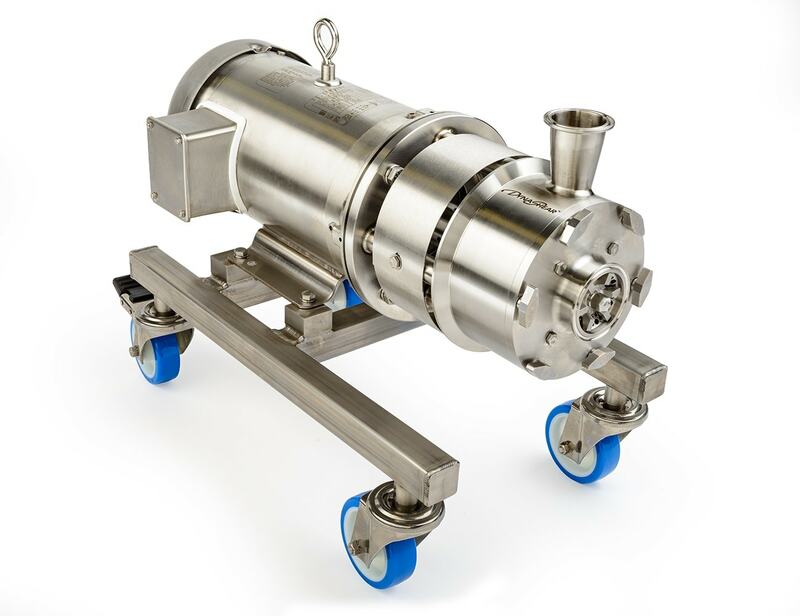 Emulsifiers Emulsifiers are industrial mixers that provide high-speed rotation and centrifugal force in order to achieve emulsification, the combination of two immiscible substances. By using a perforated screen and high velocities, substances that are generally unblendable are able to be thoroughly mixed together instead of remaining separated.